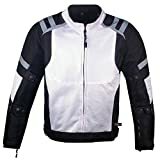 Gone are the days when you only had to settle for either a leather or textile jacket when looking for a quality motorcycle jacket. Truth is, it gets crazy hot and dripping sweat becomes the order of the day when riding during summer. 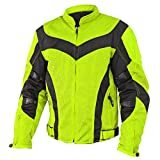 Fortunately, most companies have gone a step further and invested in mesh motorcycle jackets that feel like an extra layer of skin. These jackets boast of superior breathability, slimmer fit, abrasion resistance, and impact protection. 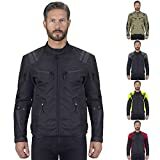 Basically, manufacturers have finally been able to present to the world market leather motorcycle jackets that strike a balance between comfort and protection. 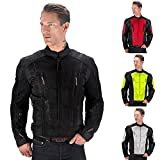 On the other hand, there are lots of mesh motorcycle jackets in the marketing making the process of choosing the best quite bewildering and confusing for most people. 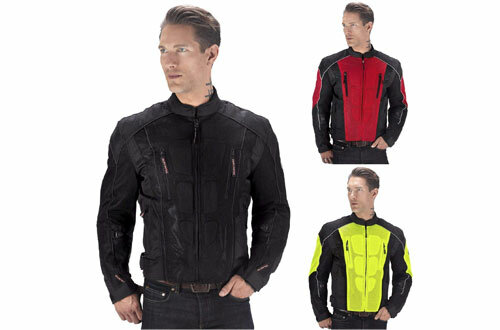 Fortunately, we have reviewed the 10 Best Mesh Motorcycle Jackets one can ever dream of owning. Without wasting time, let’s get into the individual products. 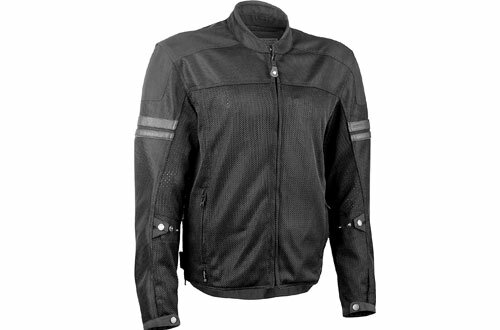 First on the list is the Pilot Motorsport Air Mesh Motorcycle jacket that boasts several incredible features. For excellent impact absorbing and dispersing, it comes with removable CE-Approved microcellular PU armour around the shoulders and elbows. Overlay panels on elbows and shoulders add strength and make the jacket abrasion-resistant. Even in poor or low light conditions, the RedTab Visibility system makes it easy for one to see the pockets and the attachment points. If you want to take things to a whole new level, you can replace the back pad with upgraded Pilot Core CE level 2 microcellular PU Back Pad. The unique combination of high-quality fabrics, trim pieces, and bar tack finishes gives this mesh jacket an appealing stylish design. 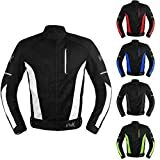 The most adorable aspect of Pilot Motorsport Direct Air Mesh Jacket is the REISSA membrane that is breathable yet waterproof. This implies, the membrane can allow moisture and heated air to escape but cannot let water in. 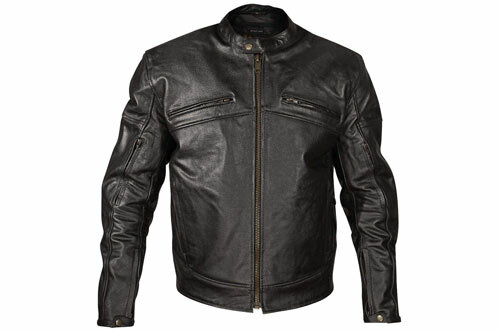 Overall, this jacket boasts of unique style, superior performance, and quality construction. 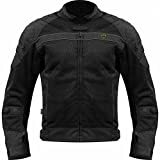 Talk of the Tri-Tex 1680 Denier Abrasion-resistant panels and the mesh chassis, the Xelement Mesh Motorcycle Jacket proves its worth. If you are looking for a jacket that boasts level-3 armour technology, look no further than Xelement, it has removable armour on the back and on shoulders and elbows. Another adorable aspect of Xelement that will impress summer riders is the full ventilation. Regardless of how adventurous your summer ride gets, this unit is perfectly designed to sustain the heat. 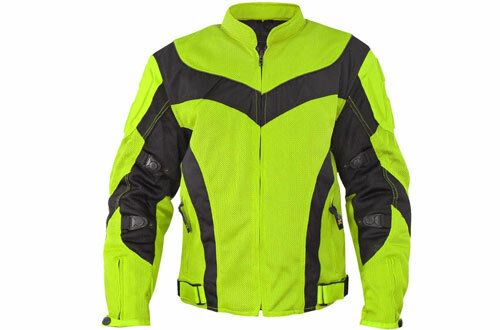 The jacket colouring is also reflective to enhance visibility during the night. 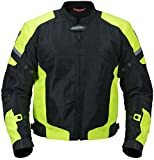 If you are looking for a mesh motorcycle jacket that focuses a lot on safety in its construction, Xelement is the best that beats the rest. 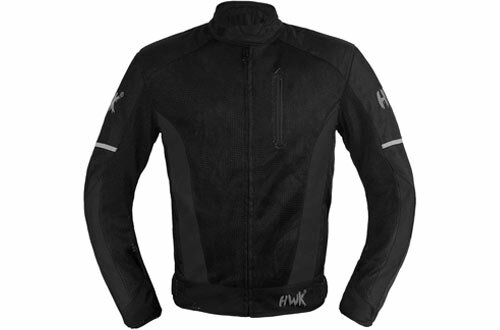 The HWK Motorcycle Air Jacket makes the best bang for the bucks given the budget-friendly price and the quality. Coming in small, medium and large sizes, this jacket boasts 600D CORDURA construction making it impact absorbing for any rough ride. On the other hand, it is engineered with macro mesh fabric on the back, the front and the back for extra strength. The inner arms are designed to allow maximum airflow for proper ventilation. Moreover, it has CE-Approved armours on the shoulders, back, and elbow and they can be removed. Even though HWK Motorcycle Jackets aren’t waterproof, they are the best choice when you want to keep cool and safe at the same time. 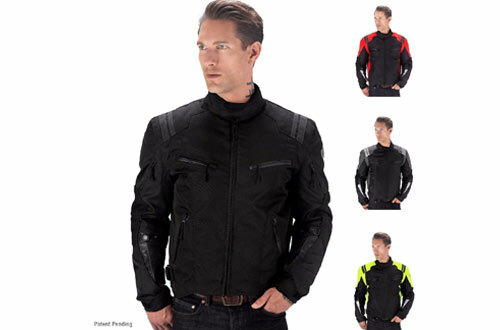 The Viking Cycle Warlock Motorcycle Jacket was simply designed for cool riders. It goes beyond comfort, protection to offer you luxury in every inch of your ride. It boasts a superior cooling mesh that covers arms, back and the torso for optimal protection. One adorable feature that lacks in most models, is the removable spine pad that keeps your spine protected no matter how the ride turns out to be. The CE-armours on the shoulders and elbow keeps you protected from abrasion and strong impact. Even better is the SureFit Adjustment System that lets you have things under control when you feel the jacket doesn’t fit well in some areas. If you are the type of buddy that loves to carry a lot of accessories around, you will find the multiple interior pockets quite handy. A headphone system is available to enable you to enjoy cool music without going through the hassle of handling dangling wires. Xelement CF380 is another advanced motorcycle jacket that is worth owning. Featuring CE-Approved armour, this jacket has passed some of the highest impact assessment tests. With adjustable Velcro waist straps, you can achieve the best fit for a summer ride. No more hitting the road and arriving home sweaty and tired, Xelement CF380 boasts a high-performance breathable and laminated fabric. Unlike other models, its level-3 armour is durable, less bulky and lightweight for a cool comfortable summer ride. For convenient storage of your accessories, there are several zippered pockets. Moreover, the underneath quilted liner and mesh can be removed depending on the weather and personal preference. The armour on them, arms, shoulders, lower and upper back can be removed. 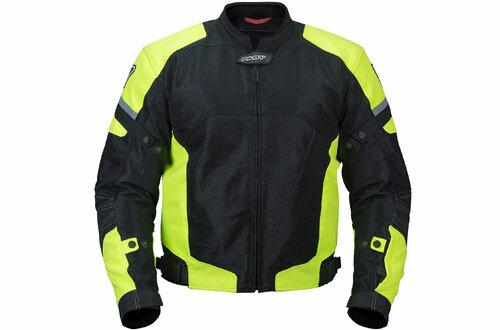 This is another top-rated model from Viking Cycle that offers riders protection in a stylish manner. It boasts removable armour on key areas such as back, spine, shoulders, and elbows. Apart from having an ergonomic design, it has an advanced waterproof treated Rock Tex 600 Outer Shell. If you love wears with great inners, you will definitely appreciate the next generation liner technology of this jacket. The lining is fully removable and features a superior insulation, the reason your ride will be cool and comfortable all through. Another pretty good news about Viking Cycle is that you can adjust the jacket in 6 key places until you achieve the best fit, thanks to its 6-Point Sure Fit Custom Adjustment System. Reflective stripes enhance visibility when riding at night. An extra pocket is also integrated with the fabric to make it easy to store and access your accessories. 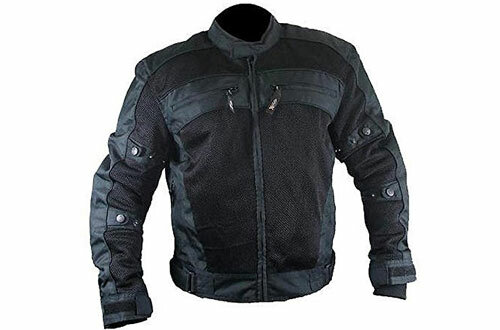 Another adventurous sporty motorcycle jacket worth your bucks is the Mens Storm Mesh Summer Armored Jacket. It is one of the favourite model boasting a number of great features. To begin with, it has an ultra-breathable lightweight poly mesh and Cordura, both of which are durable. You can comfortably ride at night owing to the 3M Scotchlite Strips that are very reflective. The inner dual-layer liner is waterproof and can be removed as per the rider’s needs. You can store all your accessories in the sleeve pocket and the two external pockets. On each arm, there is an adjustable arm sync strap. Plus, the jacket also features 5PC armour protection in key areas. 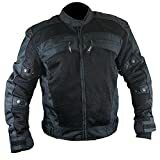 To sum it up, Men’s Storm Summer Mesh Motorcycle Jacket is the type that is engineered to tackle any weather condition. The Xelement XSPR105 Racing Jacket is suitable for those that love to combine performance and style. It has a special attention to fine details and is a pure representation of abrasion-resistant cowhide leather. It has zippered cuffs that also have snap-button flaps for a perfect fit. 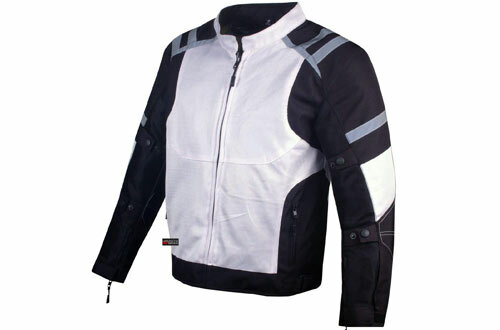 There is also an adjustable side snap button waist for optimal rider comfort. Two front zippered closures with wind flaps provide space for small accessories. CE-Approved armours provide unmatched protection to key zones such as elbows, shoulders, and the back. 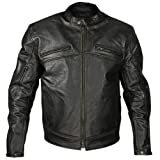 Overall, safety and comfort are well articulated in the stylish structure of Xelement XSPR105 Leather Motorcycle Jacket. Even when seasons what time you can be out there having an adventurous ride, be independent with the Highway 21 Turbine Jacket. It is a perfect way to combine safety and comfort, even when the sun is unbearably hot. 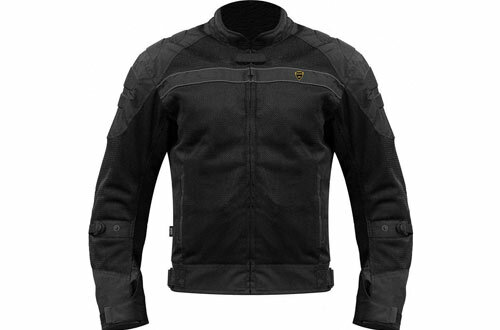 Boasting a full-bore mesh outer shell, this jacket is designed to keep you safe, dry and cool. Just in case it rains, Turbine Jacket also features a removable Hydraguard waterproof liner that will keep you dry. For versatility, zippered cuff enclosures with security snap are also integrated into the structure of Highway 21 Turbine Mesh Jacket. Two-hand pockets and inner Napoleon pockets provide adequate storage for your mobile phone among other accessories. Overall, it is the perfect wear when you want a cool comfortable ride in a warm weather. The GDM-01 is another outstanding motorcycle jacket that boasts a number of rider-friendly features. Despite featuring a breathable cooling mesh shell, it can also be used in wet and cold conditions. For excellent impact absorption and abrasion resistance, it has overlay panels at the back, elbows, and shoulders. Double stitching improves the strength. Reflective strips enhance visibility during the right and in low light conditions. Safety standards are top-notch, the removable CE-Certified armour in shoulder and elbows absorb any emergency shock and resist wear and tear. To prevent spinal cord injury, GDM-01 also comes with a removable spine pad. You can also utilize the removable and fully-insulated sleeve liner depending on the weather pattern.